After the 2nd test flight with the heavy battery the plane was left with a nasty break in the wing and needing a rebuild of the nose. To attempt to fix the wing I had to cut open the skin which was well and truly bonded on. 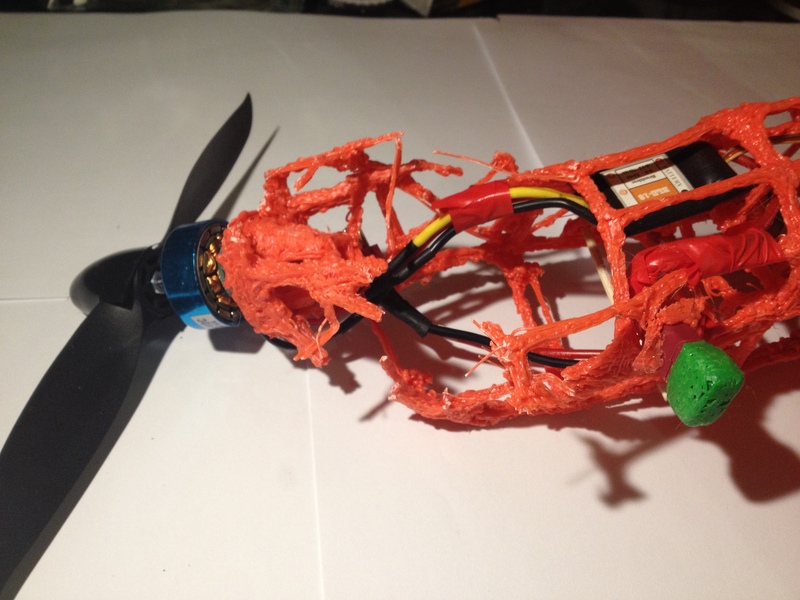 Once the wing was opened up it was fairly easy to make the repair, especially now I have the new 3Doodler nozzle set. The second larges nozzle is perfect for this scale of build and it lets the spooled filament run through the 3Doodler much easier. I was all out of the specialist wing covering so I turned to that staple of any makers tool box .. duct tape! 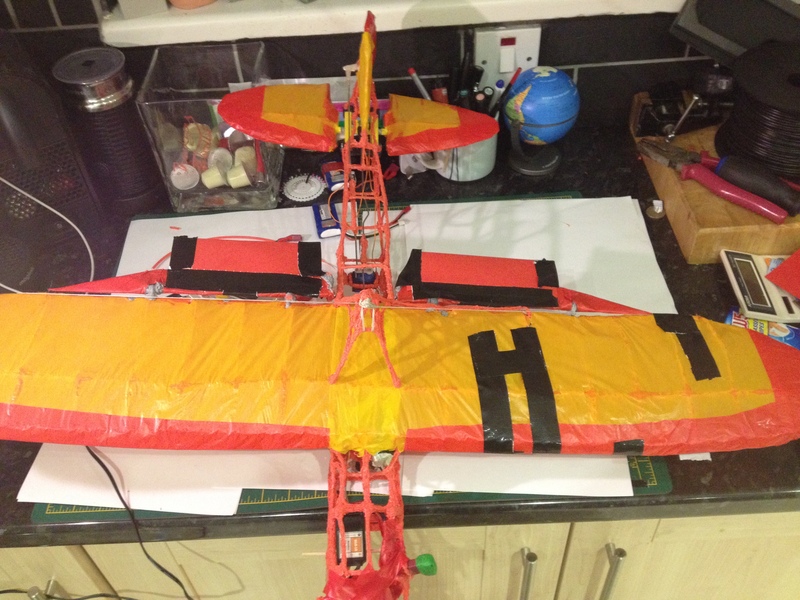 Whilst I had the duct tape out I thought I would extend the ailerons with a bit of card. Its not Ideal but I am trying to get the mods done quickly to make this last attempt at flight before the bad weather sets in. 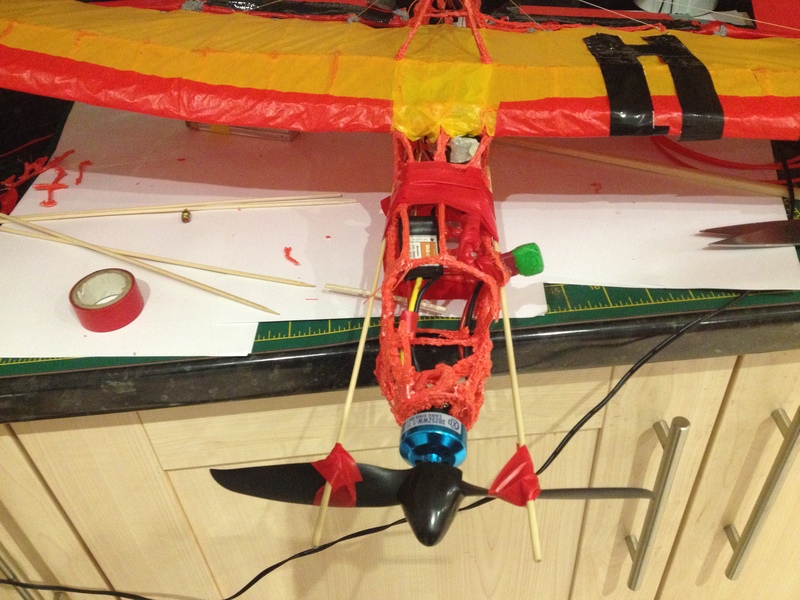 I used a couple of skewers to hold the nose straight whilst I re-built the nose. There were a few things wrong, aside from me being at the controls. The plane was tail heavy, in the last flight the heavier battery made the plane too heavy but it did at least fly level. This time the lighter battery meant the plane was light enough to fly but the centre of gravity was too far back. The fix and hasty patching to the previously damaged wing made it uneven and resulted in another turn. Perhaps if I was a bit more experienced behind the controls I might not have been able to handle the defects better, perhaps if it was a little less windy it would have flown a little longer. 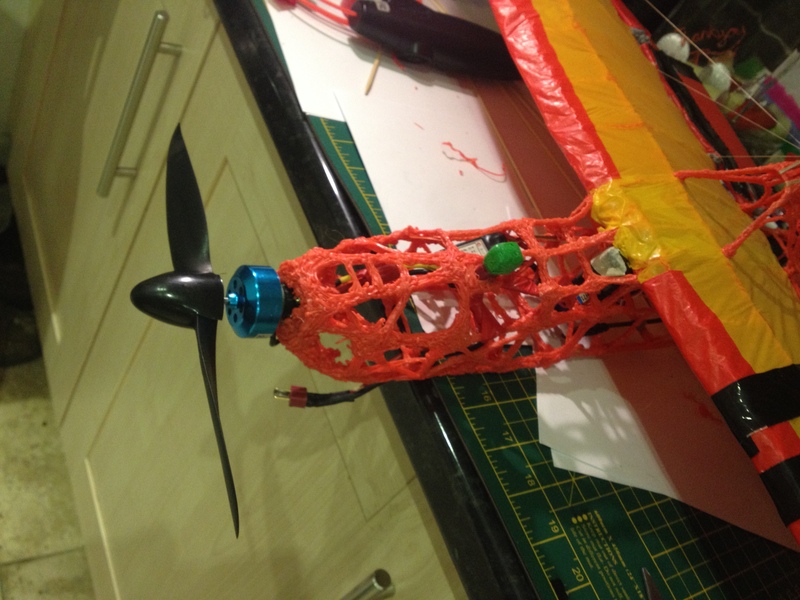 I think though the real issue is the plane I have built does not have the accuracy, control surfaces or weight distribution required for fully controlled powered flight. 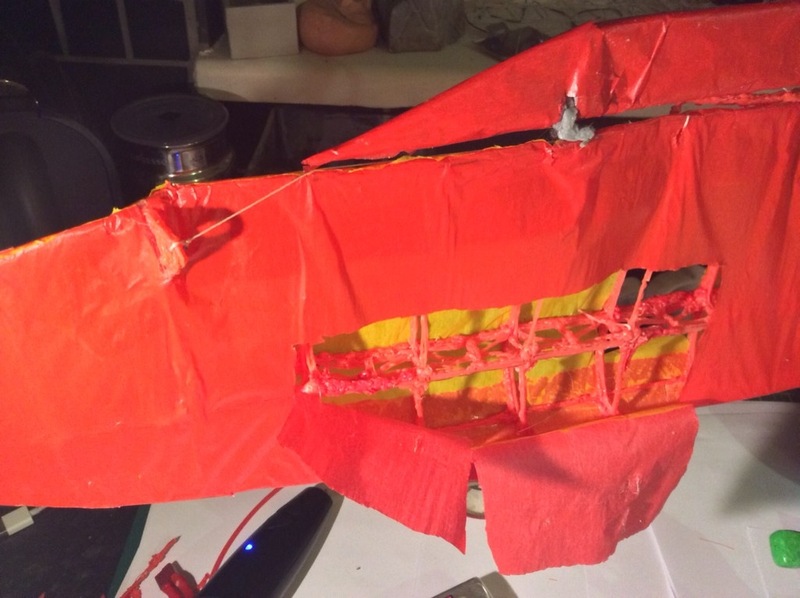 I think a little break from the 3Doodler Plane for a while, I have a few other projects I want to work on but I am determined to build a flight worthy plane. I have my eye on a simpler design and feel that I could do a much better job second time round with all that I have learnt from this build. Follow @MattBisHere for regular updates on this and other stuff! I was just watching a few of the videos. I didn’t realize you were using wing twist and, later ailerons. 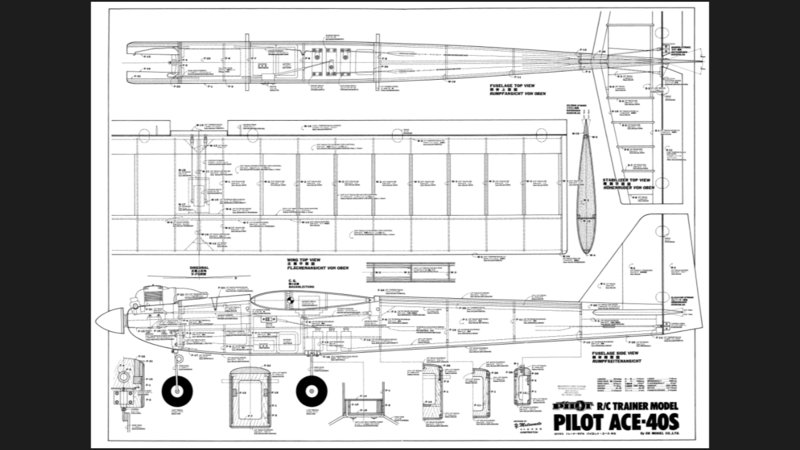 I think you’d be a LOT better off just using the rudder and elevator and making the wings as rigid as possible. You might also make the rudder and fin larger. The original design you started with appears to be for free flight. Also, there is no point in trying to fly with the c.g. too far back, unless you like breaking airplanes! Don’t fly until everything appears to be in fairly good shape. That includes at least 40 degrees throw either way on the rudder, and, I guess, no more than 10 degrees on the elevator, with little slop or friction. If you don’t use a GOOD rc pilot for test flights, you might be better off trying it as a free flight from a field of long grass. At least that way, you need things you can study and learn, as opposed to having quick reactions based on long experience. I’m told a simulator helps with the latter, though I learned on my own. I went through a lot of glue. If you do try the free flight route, you’ll need a really big field and a guide of some sort as to how you trim. Also, a motor timer unless you like long distance hiking. Still, I think the best option is a good test pilot. I have enough hubris that If you were in the Boston area, I’d offer to be your test pilot. Anyway, I hope you make another attempt. Seems like you’ve got a lot right, but not quite enough. I think your model, even with the heavy battery, could fly ok.